Pick up from Nepalgunj and transfer to Simikot by flight. On arrival at Simikot you will be transferred to the hotel/guest house for night stay. Simikot is a beautiful town in Humla district in the beautiful mountains of Nepal. Spending a day or more here is worth in terms of exploration and acclimatization. In the morning you will be transported to Simikot airport to board your helicopter to Hilsa. A 25 minute helicopter flight will take you to Hilsa. Here you will complete immigration formalities to enter Tibet side in China. After crossing the friendship bridge you will reach Sher. The Chinese bus will take you to your hotel in Taklakot. Stay at the hotel. Complete day is free to acclimatize in the high altitude of Taklakot. All meals and stay will be in the hotel. IN the morning after breakfast drive in your air conditioned bus to Lake Manasarovar. 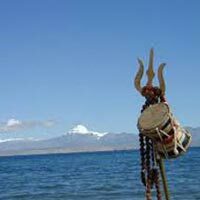 Take the round (Parikrama) of the holy Lake Manasarovar by bus or local vehicles. On the way one can stop and take a dip in the holy water of Lake Manasarovar. Night stay will be in the lodge near the lake. Early morning perform puja near the lake and pay homage to your elders. After breakfast drive to Darchenand further proceed to Tarboche. Start your first day trek to Dherapukh from Yam Dwar. Out of total 12 kms almost 09 kms walk is on almost flat ground today but about 3 kms will be little ascend. 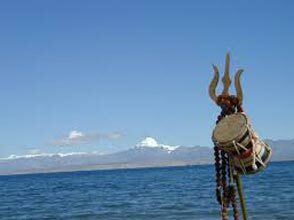 On reaching Dherapukh you will stay in a guesthouse near the north face of Mount Kailash. Early morning wake up and have darshan of glorious Golden Kailash as the first sun light touches the top of the mount and changes its colour from black to golden. This is one of the most amazing memories and pictures you will take back home from your Kailash Mansaraovar Yatra tour. Later continue your second day trek to next destination Zuthulpukh. This day is tough comparatively as the walk is for about 22 kms in total out of which about 08 kms is steep ascend and descend. After crossing Dolma La you will land at a place where you will have the glimpse of beautiful Gauri Kund which is associated with Devi Parvati. It is recommended not to go to the pond as it is quite risky because of rocky, slippery and steep descend and ascend. After having darshan of Gauri Kund continue trek to Zuthulpukh for the night stay in lodge. IN the morning continue your return journey by walk to Darchen. After about 8 kms of walk you will meet with your vehicles which will transport you to Darchen and further to Taklakot. Stay at Taklakot in the hotel.